Happy Christmas Eve and Merry Christmas, everyone! 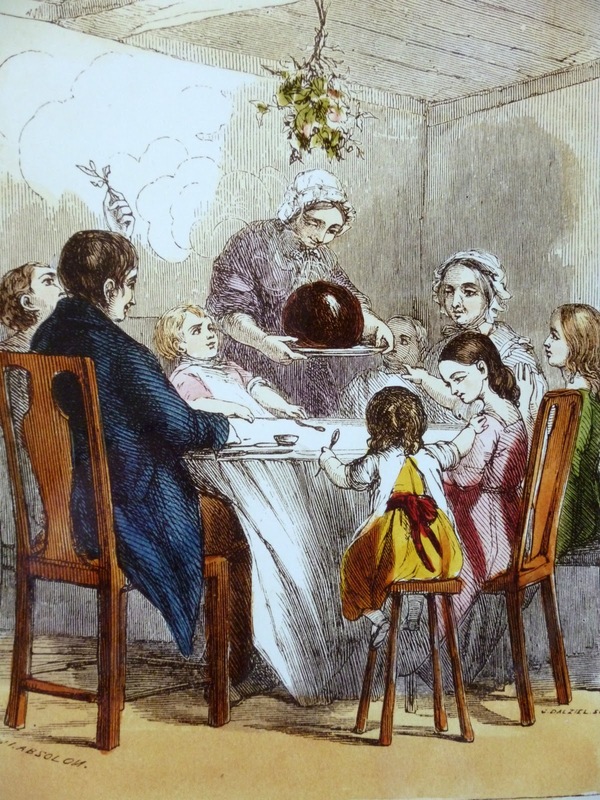 I leave you with this post about Plum Pudding as I celebrate the occasion with my favorite people in all the world – my family. May this season be a truly special one for you. And thank you for visiting Jane Austen’s World. 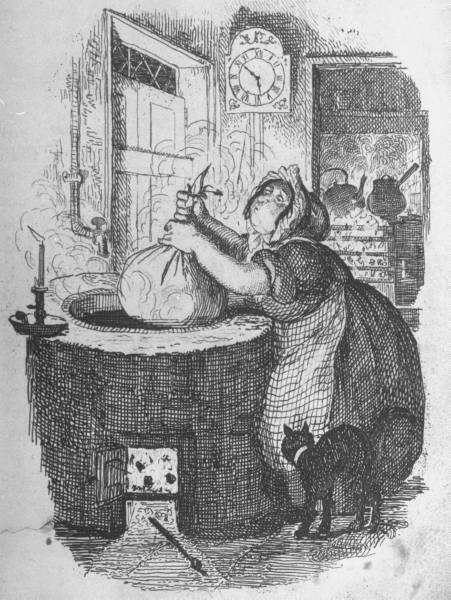 Stir-Up Day is the name traditionally given to the day on which Christmas puddings are made in England. 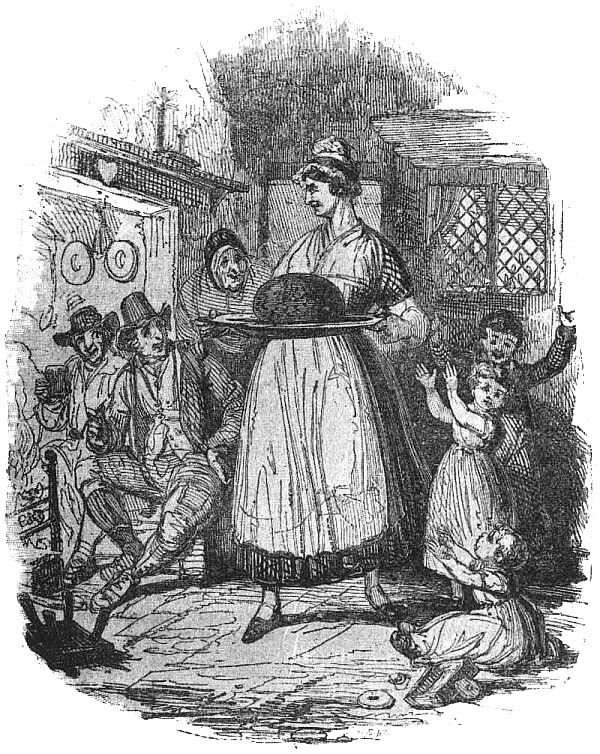 Stir-Up Sunday, the last Sunday before Advent, is considered the final day on which one can make the Christmas fruit cakes and puddings that require time to be aged before being served. Stone carefully one pound of the best raisins, wash and pick one pound of currants, chop very small one pound of fresh beef suet, blanch and chop small or pound two ounces of sweet almonds and one ounce of bitter ones; mix the whole well together, with one pound of sifted flour, and the same weight of crumb of bread soaked in milk, then squeezed dry and stirred with a spoon until reduced to a mash, before it is mixed with the flour. Cut in small pieces two ounces each of preserved citron, orange, and lemon-peel, and add a quarter of an ounce of mixed spice; quarter of a pound of moist sugar should be put into a basin, with eight eggs, and well beaten together with a three-pronged fork; stir this with the pudding, and make it of a proper consistence with milk. Remember that it must not be made too thin, or the fruit will sink to the bottom, but be made to the consistence of good thick batter. 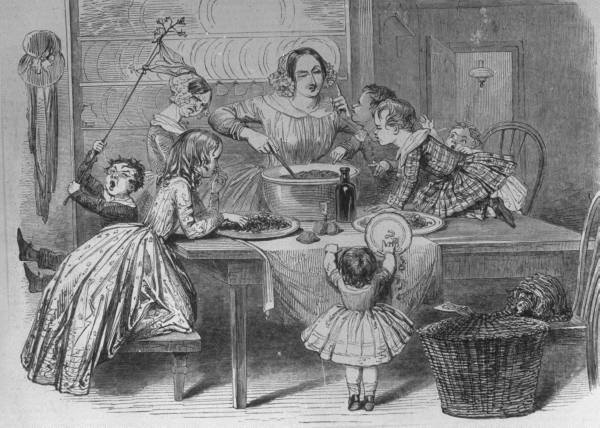 Two wineglassfuls of brandy should be poured over the fruit and spice, mixed together in a basin, and allowed to stand three or four hours before the pudding is made, stirring them occasionally. 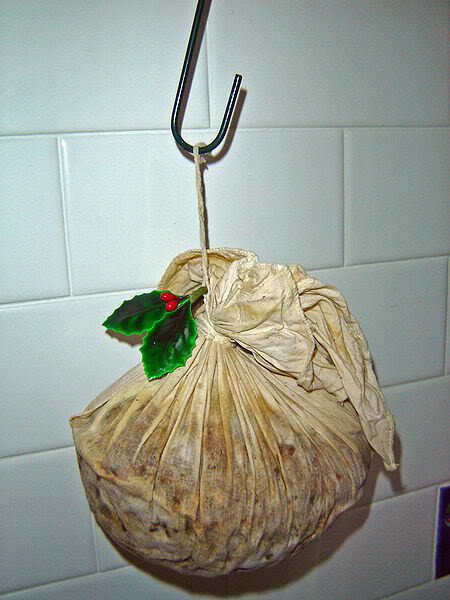 It must be tied in a cloth, and will take five hours of constant boiling. When done, turn it out on a dish, sift loaf-sugar over the top, and serve it with wine-sauce in a boat, and some poured round the pudding. The pudding will be of considerable size, but half the quantity of materials, used in the same proportion, will be equally good. 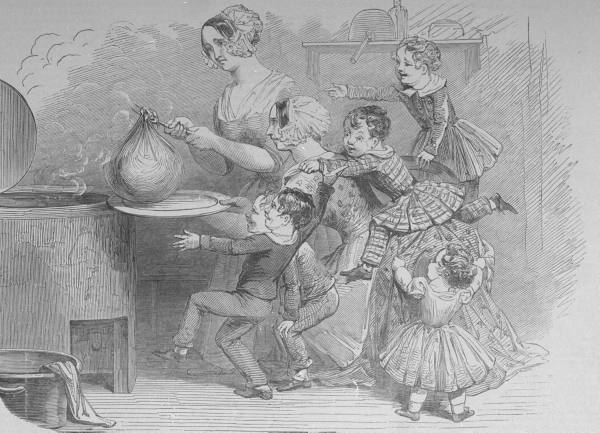 This pictorial article in eons explains the various steps in making a Christmas pudding.